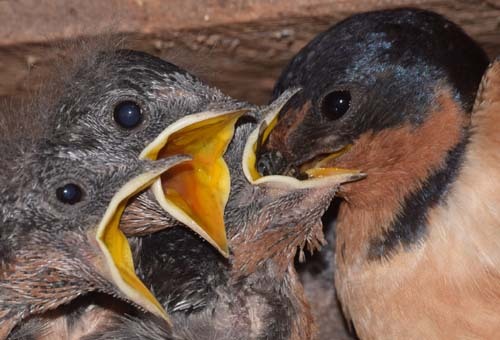 The 2015 nesting season consisted of 13 first broods and 9 second broods, all in nest cups in the swallow room. Nest cups used for the first brood were reused for the second only in three instances. The other 6 second broods were in new nest cups. The single nesting in the shelter was by house finches. 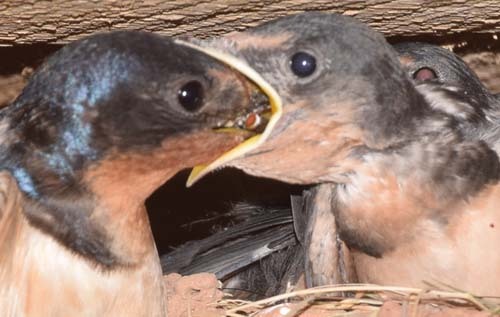 Also, the phoebes returned to the swallow room to have two broods in their usual location above a beam, rather than in a nest cup in the shelter as in 2014. To determine if my current video equipment could be used to record all feeding visits at several nest cups, cameras were mounted at two active nests and continuous video was recorded from 5am until 8pm on two days. Motion detection proved to be unreliable in showing if prey had been brought. Both nests were recorded simultaneously, using a quad splitter. The video was first viewed in moderate fast forward and feeding visits recorded with hand counters – one in each hand for each of the two nest cups. This proved unreliable, so only one of the nests was viewed at a time and at each visit, the video was stopped and examined frame by frame. This was then repeated for the other nest. This ensured that prey had actually been provided at each visit counted. However, identification of prey was still impossible in most cases. Remote photography with a DSLR, as in previous years, sometimes yielded good prey images, but the time delay when using Nikon software and a USB cable rarely produced a usable photo. However, it has become clear that the most commonly seen and identified insects are flies. 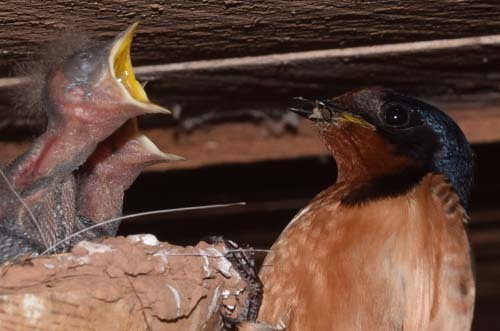 Horses and livestock must greatly benefit from sharing their quarters with barn swallows. Never the less, beakfulls of tiny gnats likely outnumber the flies brought one at a time. Continuous video of at least two nest cups will be recorded on a laptop instead of the mini-dvr used this year. It would shut down after around 5 hours even though the sd card could hold several days of video. On one day of test recording I had lost one hour (8-9am). Also, I plan to review the video without fast forward, but monitor both nests at once and stop at each nest visit to view frame by frame. This would be done the following winter and only one hour at a time, to avoid any further brain damage. Actually, thinking about swallows in mid-winter may benefit the brain. 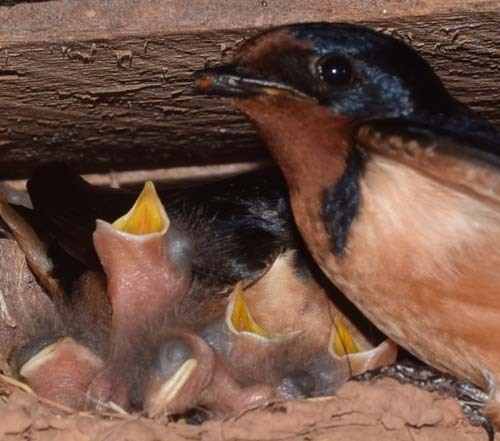 Hourly weather records will also be kept – especially of any rainfall that might inhibit the swallow’s normal hunting technique. 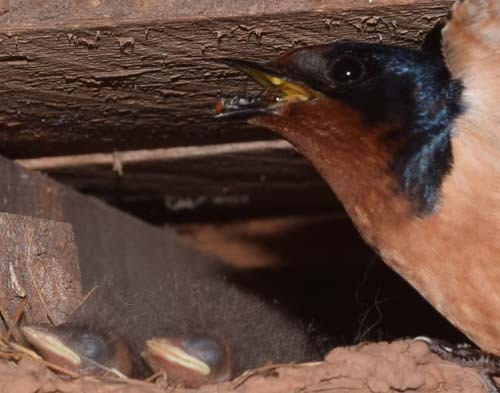 2016 Barn swallow nesting - No video monitoring was done in 2016. Diane was diagnosed with a metastatic cancer in March and lost her battle with that cancer in December. The first two barn swallows returned on April 15. There were only seven swallow first broods and five second broods. It appears that fewer swallows returned in 2016.